A rainbow of love. 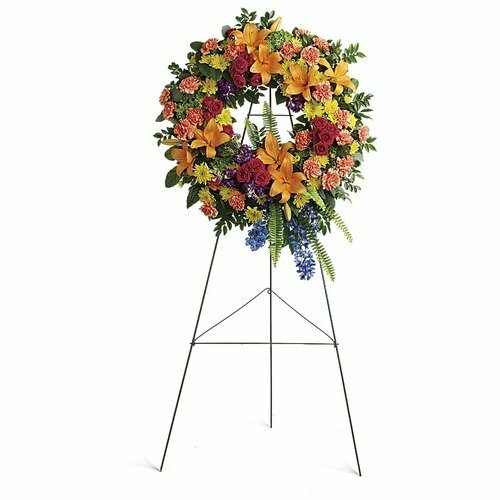 Celebrate your colorful memories of a beautiful life with this radiant wreath of hydrangea, roses and lilies. * Excellent company to deal with, definitely my first choice whenever I shop online, 5 star rating. * I have used 1st in Flowers for many years now and the recipients have always been pleased. They continue to have the best prices on floral arrangements, even when I have coupons for 15% off with some of the big name brand companies. * Excellent Product Range, Ease to navigate web site, trustworthy transactions, order confirmation, delivery update. Overall Satisfying experience.